The Atene Viewpoint Walk travels through both native bush and farmland up an historic roadway (privately owned) that was built by the former Ministry of Works and Development in 1959 during investigations for a Whanganui River hydro-electric power generation scheme. The viewpoint track ends on a black beech ridge with great views of Whanganui National Park and the cutoff river meander (the former bed of the Whanganui River before it cut a new course). There are stiles to get over fences, a toilet on the walk and at the end a seat and viewing area to stop for a rest and bite to eat before walking back down. A picnic table just 20 minutes in gives spectacular views of the Whanganui River. It takes about an hour to get to the viewpoint, but less to come down. People wanting a longer walk can continue past the viewpoint. Two hours further on an upgraded shelter, picnic table, water supply, toilet and hand-basin have been provided on the Atene Skyline Track for those wanting to camp overnight. The Skyline tramping track continues for about another three hours beyond the shelter, following the main ridge, ending back on the Whanganui River Road just south of Atene. Time: 1 - 2 hrs. Do not leave any valuables in your vehicle. For a donation, you can use a private car park at Atene. Before you go into the outdoors, tell someone your plans and leave a date to raise the alarm if you haven't returned. To do this, use the New Zealand Outdoors Intentions process on the AdventureSmart website. It is endorsed by New Zealand's search and rescue agencies and provides three simple options to tell someone you trust the details about your trip. 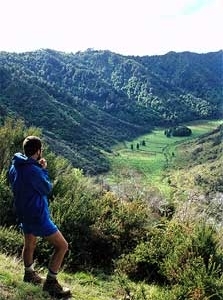 Here's the our members favorite photos of "Trails in Whanganui National Park". Upload your photo of Atene Viewpoint Walk!